Under Its Frozen Exterior, Scientists Say Europa's Ocean Is Salty Like Ours : The Two-Way Scientists have always thought that where there is water, there's a chance for life. If the ocean on Jupiter's moon Europa is salty like ours, it could also be a "wonderful place for life." 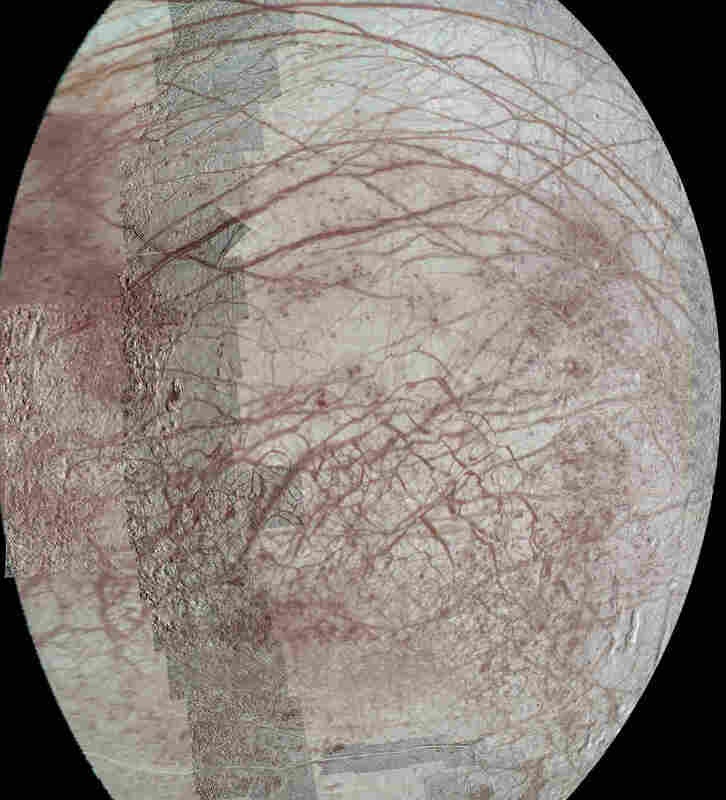 The mosaic was constructed from individual images obtained by the Solid State Imaging (SSI) system on NASA's Galileo spacecraft during six flybys of Europa between 1996 and 1999. "If you could go swim down in the ocean of Europa and taste it, it would just taste like normal old salt." That's California Institute of Technology (Caltech) astronomer Mike Brown talking about Jupiter's moon Europa. Brown and his colleague Kevin Hand from NASA's Jet Propulsion Laboratory believe that if you could drill your way through the moon's frozen exterior, the ocean beneath it would taste a lot like our own sea water. How, you are wondering, did the scientists come to this conclusion? The simple answer is that they looked at the moon's surface and using spectroscopy — that is inferring physical properties through analysis of an object's light — they were able to discern the chemical makeup. But the remarkable part is not that. The remarkable part about this study, which is scheduled to published in the Astronomical Journal, is that they were able to get past all the frozen stuff to find out what the ocean beneath is made of. They were able to do that because bits of the ocean are working their way toward the surface. "We now have evidence that Europa's ocean is not isolated—that the ocean and the surface talk to each other and exchange chemicals," Brown said in a press release issued by the W.M. Keck Observatory, which they used to make the measurements. "Europa is considered a premier target in the search for life beyond Earth, Hand said. A NASA-funded study team led by JPL and the Johns Hopkins University Applied Physics Laboratory, Laurel, Md., has been working with the scientific community to identify options to explore Europa further. 'If we've learned anything about life on Earth, it's that where there's liquid water, there's generally life,' Hand said. 'And of course our ocean is a nice, salty ocean. Perhaps Europa's salty ocean is also a wonderful place for life.'"